Tor-proxy is a free proxy-server service that Internet users can use to hide their IP address while surfing the Web. An IP address is a number used to identify computers on the Internet, and for reasons of safety and security, it may sometimes be desirable to hide the address. 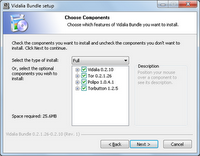 Vidalia is a GUI (graphical user interface) implementation for Tor, It allows the user to start, stop, and view the status of Tor; monitor bandwidth usage; view, filter, and search log messages; and configure some aspects of Tor. Node 5 Neither knows the actual origin nor the actual destination. Node 9 Knows the actual destination but not the actual origin. 4. Now open Mozilla Firefox browser,and click on red highlighted Tor Disabled ON which is at the right hand corner of the browser , now it will turn green and say Tor Enabled.